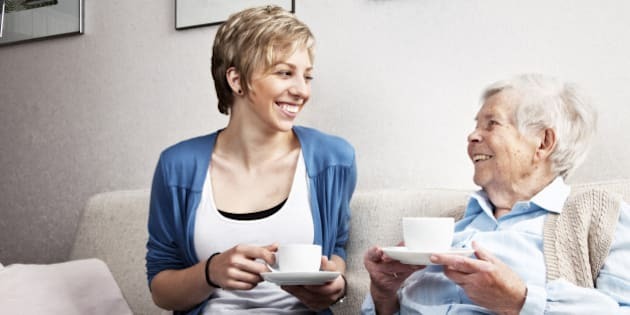 As discussed in previous blogs, communicating with people who are living dementia can sometimes be difficult. I want to thank those of you who told us about the successes you have had with our resource that we have called "Let's Chat". Your stories were heartfelt. I love hearing about how people with dementia start talking, reminiscing and engaging socially with others when the right prompts are provided. After I wrote the blog on communication tips I was asked if I had a short list of questions that one could post or print and put in their purse or back pocket. In this blog I would like to provide a list of questions for those of you who need a short list of discussion ideas/questions to freely access when needed. I have also posted this list on Pinterest. A few topic ideas are presented below. I encourage you to create your own questions. Don't forget to write your ideas down and share them with others. Some questions stimulate conversation more than others. Share your successes. Happy chatting . . .
To help those who are living with dementia to engage in meaningful conversation, while stimulating memories and fostering pleasurable social connections. 1. Would you rather do math problems or join a spelling bee? Why? 2. What would you like others to know about you? 4. How would you describe a 'perfect vacation'? Who would you be with on that vacation? 5. What advice would you give to new parents? 6. Did you like listening to jokes told by people like Bob Hope or other comedians? Do you like to tell jokes? 7. Have you ever gone for a long boat ride? Did you enjoy being on the water? 9. What was the best day of your life? 10. What is your favourite type of animal? Why? 11. Do you enjoy dancing or singing? Tell me more. 12. Would you rather do art or write a poem? Have you ever done either of these things? 13. Do you think people should be interested in politics? Why? 14.	Who is the funniest person you know? Are you funny? 15. Do you prefer the colour blue, pink or purple? Why? 16. If you were to plant a garden, would you prefer to plant flowers, fruits or vegetables? Are you a "good gardener"? 17. How would you define romance? Are you romantic? 18. Are you a good cook? Who is the best cook you know? 19. Do you remember the first days and weeks of your first job - or any job? 20. Would you prefer to solve problems or spend time being creative? 21. Do you believe people should share their worries? 22. Do you think it is a good idea to give teenagers a credit card? 23. There is an old expression: "Children should been seen but not heard." Do you agree? 24. If someone wanted to teach you how to do car repairs would you be interested in learning more? 25. Do you know how to use a computer or a cell phone? Have you ever searched the Internet or done email? If not, would you like to learn? Keep adding to the list - and keep on chatting with those who need our help to stimulate conversation, memories and human connection! If you would like additional ideas and would like to learn about additional resources that can be used with those living with dementia visit www.dementiability.com .